Online roulette is a great way for Canadian players to learn and improve without going to a bricks and mortar casino. But did you know that it is possible to replicate the real life casino experience on your computer? Live dealer does just that by putting a real roulette croupier into your living room. It doesn't take a lot to get started at a real dealer roulette site, but there are some things you need to know to make your real money gaming experience top notch. Read on for all the ins and outs of live dealer roulette. The best live dealer roulette sites in Canada in 2019 use great up to the minute technology to ensure Canuck players get the best possible experience. Casinos offering online roulette with live dealers will broadcast in real time from a studio, sometimes with blackjack or baccarat tables visible to imitate a real casino, with players receiving a video feed. From the player's point of view, bets are placed just like in any other online roulette game. The only difference with live dealer roulette games is you see a real dealer spin a real roulette wheel via video, rather than having an automated wheel with no human interaction. Generally speaking, live dealer roulette games should be compatible with any decent PC launched to the Canadian market in the last few years. As long as you have a good internet connection and are able to stream videos smoothly then you should have no trouble whatsoever enjoying online roulette with live dealers in 2019. Live roulette online video feeds are one-way, so there is no need to worry about whether the webcam on your computer works. Indeed even if you don't have a webcam at all then it will not stop you playing live dealer roulette games, as betting is done in the same way as standard online roulette games on all Canada online casino sites. While Canadian online casino sites have their random number generators tested regularly, some players will still prefer to remove any doubt by making sure they can see a physical roulette wheel spin before placing their bets. With live dealer roulette games there is no question as to whether things are truly random. You also have the advantage of being able to chat in real time with a real person. This is just another way to mimic the experience of a bricks and mortar casino without the downside of driving for hours to play for just a short amount of time. The chat function in live dealer roulette games just adds another layer of involvement not available in standard online roulette games where your only communication comes in text form, often just through generic messages. Just as you place your bets in the same way as you would at a regular online roulette table, live dealer players can type out their communication to the dealer as they would in any online casino game. However the difference is that the dealer will respond verbally, breaking down the barriers between player and dealer that are sometimes apparent away from live dealer games. There are a huge number of top sites offering online roulette with live dealers for players from Canada to choose from. For this reason we have recruited a number of experienced players to review the real money gaming sites available in 2019 and identify the best. Our reviewers have put in hours upon hours of research, by playing on a selection of live dealer roulette sites to get a feel for each of them. They have taken into account things like the range of games offered as well as the quality and consistency of the individual dealers across the board. Live dealer online Roulette is for savvy Roulette players. 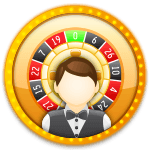 For Roulette players who want to have the convenience of online play but the live casino experience of a real dealer at the same time, then live Roulette is the way to go. As far as how it works, it is just like online Roulette, except that there is a live dealer running the show in real time right before your eyes. It's like watching live action unfold on your television set, but this time you are in direct contact with the action and making decisions based upon the game. You will make your bets the same way you would when playing online. But the difference is that instead of a random number generator choosing the winning number, a live dealer will drop the ball and spin the wheel just as if she was at a brick and mortar casino. You even get to virtually high five other players at the table. How is it different to other Roulette games? When it comes to comparing online and live Roulette, let's start with how it is the same. The bets and odds are the same. There are not as many varieties with live, but you can expect to find European and American. Sometimes you might find a French game, but mostly the two favourites. Focusing on the differences, you will find a live dealer is one who will communicate with you in real time. There will be live streaming from multiple cameras all on the dealer. You get to interact with real human beings, both players and the dealer. The spin of the wheel is accomplished organically, and it does not use RNGs - random number generators. That puts a lot of serious Roulette players at ease. What variation does it use? You will find the standard varieties at play, American and European for the most part. There are times that you may find a French version, but count on either European or American. Remember, when using international sites that are primarily located out of Europe, you will find a greater frequency of the European variety. That is great news, considering most land casinos throughout Canada employ the American variety. All up-to-date PCs or devices capable of live streaming will work wonders with live dealer Roulette. Provided that you are not still trying to use your Apple from 1995 or a Compaq from 1998, then you should be able to stream live dealer table games. Most important is that you have a high-speed Internet connection. That is necessary to maintain a real time feed. All of the sites that we have recommended for your immediate pleasure will encourage you to test your device for compatibility prior to getting deep into the action. Look no further when it comes to finding the best real cash games. We have already done the legwork and homework for you. The best games are located at the best sites, of course. Great sites await you with high-energy action, and great bonuses too. Yes, it is really live. In fact, to prove that live dealers are live, they will actually be able to communicate with you. If it wasn't live, there would be no way that they could respond to your wins, know your name, and, yes, look at your face should you be showing off in face-time. You will be able to see your dealer interaction with everyone at your table. Multiple cameras are catching the action from many angles. Online Roulette, whether using a live dealer or RNGs (random number generators), is not rigged. When it comes to live dealer, cameras are catching and recording every movement from multiple angles. Also, there will be a pit boss, just like at a live casino. With all of the cameras, eyes, and regulations in place, you can rest assured that there is no rigging at play. When you take advantage of downloaded versions of live dealer table games, you will not use quite as much data. In reality, it takes up about as much data or bandwidth as watching your favourite movie. If you are attempting to play live dealer Roulette with a mobile device, be certain to check with your data plan prior to spending too many hours at it.